A dvances in subtype-specific treatments, immunotherapy, ongoing issues with younger patients, the optimal use of neoadjuvant and adjuvant regimens, and molecular testing will all be at the forefront of discussion during the 20th Annual Lynn Sage Breast Cancer Symposium. The meeting, which is organized by the Robert H. Lurie Comprehensive Cancer Center of Northwestern University, will take place October 11 to 14, 2018, in Chicago, Illinois. Annually, the program features oncologists in medical, surgical, and radiation specialties, who evaluate the current approaches in practice and share insight on developments in the breast cancer pipeline. William J. Gradishar, MD, chief of hematology and oncology in the Department of Medicine, Betsy Bramsen Professorship of Breast Oncology, and professor of medicine (hematology and oncology), of the Robert H. Lurie Comprehensive Cancer Center of Northwestern University, is chair of this year’s symposium. One of the two keynote presentations will include Gradishar’s lecture, “A Frontline View of the Last 20 Years and Where We Go Next,” which will highlight the evolution of breast cancer treatment and hopeful advances going forward. " Overall, there are going to be very nice sessions for triple-negative breast cancer and local therapy–based subtypes," said Ruth O'Regan, MD, a 2018 Lynn Sage Breast Cancer Symposium faculty member. "Dr Gradishar is going to show all of the successes that we have had in breast cancer over the past 20 years, so that will be very exciting." Molecular testing is an additional topic being more frequently considered in the breast cancer landscape, as it can help identify which patients may be eligible for less-intensive treatment regimens. 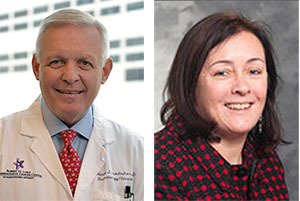 At the 2018 ASCO Annual Meeting, findings of the phase III TAILORx trial demonstrated that adjuvant endocrine therapy alone is noninferior to adjuvant chemoendocrine therapy in patients with hormone receptor–positive, HER2-negative, node-negative early-stage breast cancer who have an intermediate risk of distant recurrence based on the Oncotype DX Breast Recurrence Score test. The data are significant, investigators noted, as it can allow thousands of patients to avoid overtreatment with chemotherapy. The noninferiority of endocrine therapy alone compared with endocrine therapy plus chemotherapy (HR, 1.08; 95% CI, 0.94-1.24; P = .26) met the trial’s primary endpoint. However, O’Regan, a professor of medicine at University of Wisconsin School of Medicine and Carbone Cancer Center, did note that while the findings are significant, it is not necessarily enough to change practice. "The fact that overall, the trial showed no benefit in adding chemotherapy to endocrine therapy, is an enormous advance in breast cancer," said O'Regan. "Although it is confirmatory and really important, and will expand the use of this testing so more women can avoid chemotherapy, it is not a practice-changing trial. But anyone can be convinced by these data that this test is very important and should be routine for patients with node-negative estrogen receptor–positive breast cancer." "The talks on genomic testing are going to be interesting because there is going to be an update to the [National Comprehensive Cancer Network] guidelines as far as early-stage breast cancer soon," said O'Regan. "The one that has the most prediction in terms of who needs chemotherapy in the node-negative setting is clearly the Oncotype DX test. That being said, there are a number of assays, including MammaPrint, that are prognostic and are able to identify a group of women who have a very low risk of recurrence." Immunotherapy will also be a focus of the meeting, following recent clinical trials that have demonstrated benefit with checkpoint inhibitors in select patients, specifically those with triple-negative breast cancer (TNBC). The Connie Moskow Memorial Lecture, “Immunology and Breast Cancer,” will be presented by Mary Disis, MD, director of Tumor Vaccine Medical Oncology, Department of Medicine, Division of Oncology, University of Washington Medicine. Data presented over the last year have shown antitumor activity in patients with metastatic or unresectable locally advanced TNBC. In the phase III IMpassion130 trial, frontline treatment with the PD-L1 inhibitor atezolizumab (Tecentriq) combined with nab-paclitaxel (Abraxane) was found to significantly reduce the risk of disease progression or death versus nab-paclitaxel alone. Full data are planned to be submitted at an upcoming medical meeting. These data follow phase Ib findings of the combination, which was associated with a confirmed overall response rate of 66.7% as a frontline treatment for patients with metastatic TNBC. Trials have also evaluated the role of pembrolizumab (Keytruda) in patients with TNBC. Most recently, findings of a preliminary prospective study showed that half of patients with metastatic TNBC achieved disease control when treated with the PARP inhibitor niraparib (Zejula) and the PD-1 inhibitor. Thirteen of 46 evaluable patients had objective responses to treatment with the combination and an additional 10 patients had stable disease. Additionally, the phase Ib/II ENHANCE1/KEYNOTE-150 trial highlighted the combination of pembrolizumab with eribulin (Halaven), which demonstrated a 26.4% ORR for patients with metastatic TNBC. “It is a great meeting, and I encourage people to come. It is a really good overview of the most important topics in breast cancer right now,” O’Regan concluded.